With a simple image created with a few LEGO pieces, Flickr user polywen speaks to the hearts of geeks everywhere. And polywen does it in that close-talking, husky-voiced way that’s kind of titillating as long as it’s not coming from your Grandma, the menthol-cigarette chain-smoker. Everyone knows about Emperor Palpatine’s treacherous Order 66 which called for the killing of the Jedi. Few are aware of his lesser known but far more beneficial Order 67, in which he orders the immediate execution of the most annoying member of the Galactic Senate. Et tu Commander Cody? Jar Jar Binks’ intestines look like the plastic snake that came with the Yoda action figure from Kenner I had when I was a kid. Nutty coincidence, or is polywen rockin’ the poetic license? Okay… So. I was so excited when I read ‘contest’ that I didn’t read the rules all the way through… Yeah. (i’m a geek in more than one way) Do I totally win the “Derision” prize? I hope so, because I at least deserve that. Sweet sadness, Batman! Poor Jar Jar. I have a dog (dachshund) that looks like Binks, with the long ears and dopey eyes. He’s kinda stupid, too. Maybe he’s some sort of intergalactic relation? I’ll say this about Bryan: he’s got you all beat on eloquence. 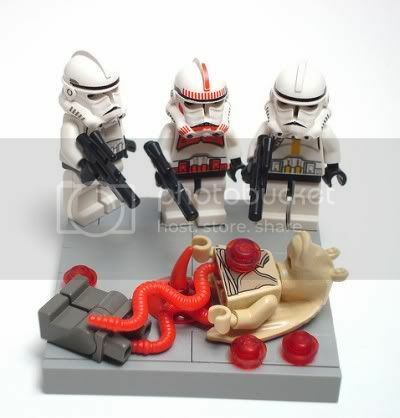 It’s hard to imagine troopers’ blaster fire resulting in a halved and disemboweled Jar Jar. I’m thinking Jar Jar called someone “Annie” one too many times, and the troopers are just deciding which one has to clean up the mess. I’m not suprised that these troopers would blast Jar Jar. What concerns me is the extent they took it to. I believe the snakes are from the new Indiana Jones sets. Am I the only one who likes JarJar? Someone who likes Jar Jar, what a freak.